One Indian Girl by Chetan Bhagat is a story of Radhika Mehta, an intelligent and successful lady who works at a top Investment Bank. The novel takes a deep look at the problems faced by any employed Indian women in all walks of life, be it work, society or love. Not only she earns a lot of money but also has an opinion on everything happening around her. There is a guy, Debashish, who is good-looking and intelligent enough to strike perfect chords with Radhika. But, eventually problems arise in their relation as Debasish do not earn as much as Radhika. While Radhika is getting over Debashish, Neel comes enters her life and helps her overcome the disastrous breakup. He married and almost 20 years elder to Radhika. In that course, Neel and Radhika share a short-lived but intimate relationship. All this happens in the precap as at the beginning of One Indian Girl, Radhika is getting married to Brijesh at a lavish destination wedding. At this time, Debashish suddenly regrets his decision of breaking up with Radhika. Towards the climax of One Indian Girl, there are three guys who a likely to marry to Radhika and her future depends on the choice she makes. One Indian Girl is written by Chetan Bhagat who has tried to highlight the issue of Feminism and inequality for women in Urban India. It is about difference how a male with the same lifestyle and choices are accepted by society while a female doesn’t. 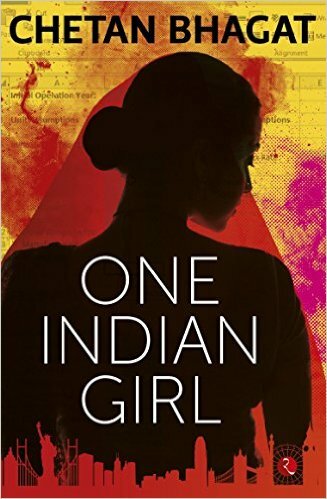 One India Girl is the 9th novel by Chetan Bhagat in which has dared to write in the first person with a female perspective. And it’s worth to read Chetan writing in a female’s voice. One Indian Girl is a must read for Chetan Bhagat fans because this time you’ll get know a feminist point of view from Chetan’s eyes. Chetan Bhagat is the most selling English-language novelist in India’s history. Time magazine named him amongst the ‘100 most influential people in the world’. The Fast Company, USA, also listed him as one of the world’s ‘100 most creative people in business’. Chetan Bhagat married Anusha his classmate from IIM-A and now he lives in Mumbai with his wife and his twin boys, Shyam and Ishaan. He also writes columns on Youth, Career, and Social issues in major English & Hindi newspapers.